“In the shot and smoke of battle 4 crew aboard HMS Victory strive to destroy the Combined Fleet of France and Spain. 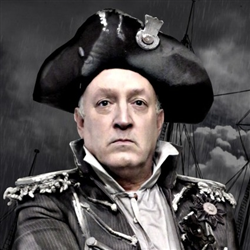 For 200 years since then Vice Admiral Horatio Nelson has stood patiently on his column in Trafalgar Square watching the world change… A well researched, cleverly woven tale of our brave, inspirational but flawed British hero told by a cast of characters – all ingeniously played by Nick Collett!” In this interview, Paul Levy talks to Nick about creating this solo show, Nelson: The Sailors Story, the research that went into it, and his plans for for sailing it into the future. 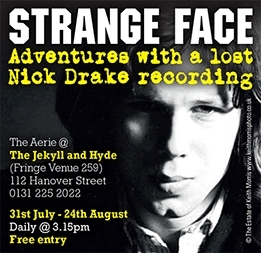 There’s an extraordinary story at the heart of Strange Face – Adventures with a Lost Nick Drake Recording. Michael Burdett (creator of The Strange Face Project) has travelled the country and brings stories and views on a musical legend whose music, according to Burdett, is “pure weeping”. Michael discusses Nick Drake and the creation of a Fringe show with Paul Levy. Are you ready to post your review? Watch the video guide here (we’ve updated our ratings but not that part of this video but the video doea show you how to post a review). Please fill out the WHOLE form as described in the video. And spell and grammar check your reviews or you’ll ensure the editors have a rotten Fringe. The digital workplace is both a metaphor and a tangible reality. As a metaphor it refers to both virtual work (especially the interaction of content with content in meaningful and useful ways) and also the physical workplace where this involves digital interfaces (e.g. through the screen). When I am sending an email I am in the physical workplace. I believe human beings are nearly always in the physical workplace, working with processes and content that IS in the digital workplace. When I am replying on a forum I am in the physical workplace but the metaphor of “forum” inspires my imagination a little more and I will tend to imagine my “avatar” (more or less) as “in” the forum. By the time we have several metaphors such as “Second life” and “Second life personum” etc, there is a possibility that I have imagined an aspect of my self that is a rendition of my self INTO a digital space. Here I exist in the physical workplace and in an imagined/projected “other” space. In the Matrix, this complete projection involves a forgetting of the physical space, at least for a time – a full projection or transference. In my view, the large disappointment of virtual spaces such as Second Life lies in the fact that human beings are essentially clumsy physical beings. We don’t render well in digital spaces where processes can be much less clumsy than we ourselves. So, the digital workplace is two fold in my own ideal view of it. It is a physical place where we engage with digital content, process and technology. And it is an ab-human place, where the citizens are content, and processes help content to interact, mapping genomes, working through decision models, behaving in artificially intelligent ways, and interfaces allow human beings, as “farmers”, to plant, tend and harvest what is there. This year’s debate took place in Brighton in May 2009 and explores the issue of subjectivity and objectivity in reviewing. Well worth a listen here. FringeReview welcomes applications to join our review team. Reviewing is unpaid, though of course, you get your free ticket to the show. You agree to post the review, according to our policy within 48 hours of seeing a show. 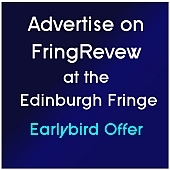 Reviewers on FringeReview know their theatre and work, or have recently worked as theatre practioners – writers, directors, theatremakers, performers. Send us a C.V and a sample of recent writing, ideally a couple of theatre reviews. It’s very important you read the documents on this resource site, especially our reviews policy which you’ll have to agree to, before writing for our team. 3. Drop us an email with CV and writing samples attached. If the show you have seen is not one, based on your attempt at objective review, that you could recommend to potential audience-goers, then you need to follow this procedure. 1. You do not post a review. Instead you contact the company directly (if the company didn’t provide contact details, the go via the venue and/or the promoter) and inform them that, in accordance with FringeReview’s policy, the show did not meet our RECOMMENDED (the old three star) threshold of a recommended show. Offer to give feedback if the company is open to it. They may not be, in which case, the matter rests there. There is a FringeReview standard letter you can send here. In the end, it is up to you how you contact them, but contact them you must. Do not give feedback without first asking whether the company/performer wants the feedback. Some companies are very open and responsive to feedback, others not. You can also use your own discretion. If you want to contact by phone, this is also okay as long as, with all communication, you observe feedback. 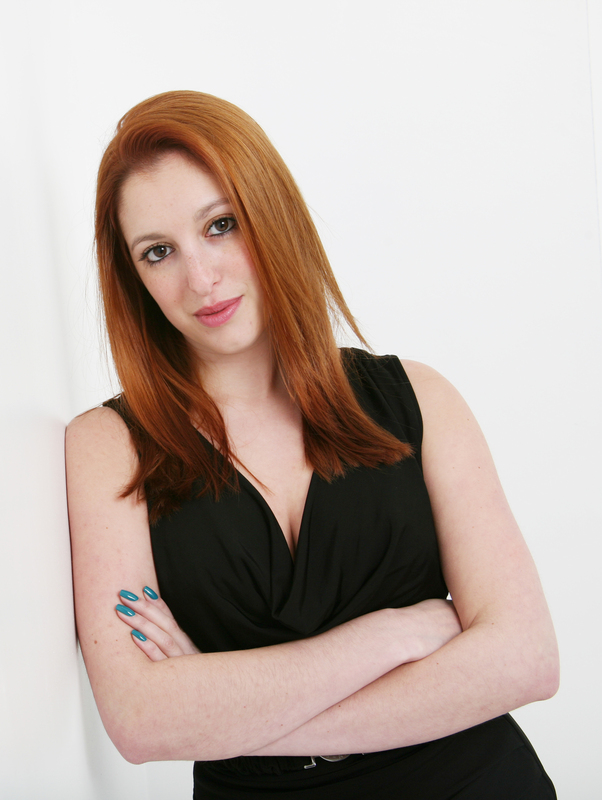 The review team are working writers, journalists, directors, dramaturgs and actors. The reviewers are active in the field of theatre and seek to review shows representing innovation, challenge, competence and creativity in the field. We do not seek to review all shows in a Fringe festival. Choice is often intuitive. Our aim is to find good shows and review them. We keep our ear to the ground. We do our research. We do not review at random. Most of these reviews have involved getting a second opinion within the review team. We seek only good shows. If we find a show that is less than RECOMMENDED, we offer the review privately to the performing company.artist. We do not publish it to our site. Why? Because FringeReview has decided to be a publication that provides reviews of RECOMMENDED theatre – shows that are, in our view, worth seeing. We may be the only review a show receives and it is not our aim to ruin the chances of shows in Fringe Theatre. So, we offer to remain silent on shows deemed by us to be less than good. This is a site to find theatre we believe to be good or better. This is a site of recommendations. FringeReview prides itself on attempting to review the theatre we see: as writing, as performance, as staging, as design and production. Subjectivity will always play into a review and we want audiences to know what a reviewer personally thought or felt about a show. However, the rating is set through an attempt to detach from that personal reaction of “taste” and to focus as objectively as possible on the quality of the show as a piece of assessed theatre – its skill, it professionalism, its accomplishment as performing art. We don’t claim to be objective, but we do try to be, and we think it’s worth trying. Our reviewers do not review shows in which there is a clear conflict of interest with current , future or recently completed work projects in which they have an involvement. They do not review shows that compete for the same time/date slot as a show they are involved with. They do not review shows in which there are people they are have a current significant social or professional connection with. This is self-policed but the FringeReview editors will take direct action against any reviewers breaking this code of conduct. We have dropped the use of star ratings as of August 2013, though reserve the right to still use them if necessary. A NOT RECOMMENDED review represents a poor example of the genre. It is not recommended by us for its content/writing or stage craft/direction. Constructive feedback is offered as to why the show is poor and how it could be improved. The writing and staging may be unclear, the ideas not realised, the performances poor in terms of impact and demonstrated stage skills. The show may be confusing to the audience, technical aspects may be clumsy. The show may have merits and may have been appreciated by part of the audience, in which case, this is reflected in the review. A less than recommended review is not published but will be offered, in any case as private feedback if the performing company is open to the feedback. A RECOMMENDED review is GOOD to VERY GOOD. The show is recommended by us either for its strong content/writing or stage craft/direction. As a RECOMMENDED show, the show is strong in areas, not so strong in others. The review reflects this and presents reasons why an audience might want to see the show. We pick up on audience feedback. A HIGHLY RECOMMENDED show is excellent. The show falls short of being an example of the best in the field, either in terms of writing and/or performance/direction/stage craft. The show is excellent though, well worth seeing and has some excellent qualities. The review reflects this and presents reasons why we strongly recommend an audience might want to see the show. We pick up on audience feedback. The show could improve and may be early in its development, showing real promise and achieving high standards. It may lack that “something really special” but be a good example of a very professionally written and staged piece of theatre. Acting , directing and writing is of a very high standard. This could be an excellent show that lacks some originality, or simply needs that “final push” towards being breathtaking, awe-inspiring, wonderful theatre. An OUTSTANDING is a show that is beyond EXCELLENT. It shows consistently impressive quality in writing, staging, design , performance and direction. It represents the best in the field. It’s innovative, different, perhaps ground -breaking. An outstanding show may also contain constructive feedback, for we believe in innovation in art. An outstanding review may also be achieved if the show doesn’t achieve excellence in all areas but still profoundly excels in certain areas, especially if it breaks new ground in a way that leaves an audience in awe. We seek audience feedback of course. We do moderate our reviews for offensive language or starring that doesn’t follow our review policy. The theatre world is a connected place. Our reviewers must have no close social connection with shows they are reviewing, nor an active professional relationship. We expect our reviewers always to declare a conflict of interest. Any reviewers breaking this ethic are immediately removed from the review team. Our reviewers may sometimes also be, as theatremakers, staging their own productions or be involved in a Fringe production. Our reviewers can have their show reviewed by a FringeReview reviewer, subject to the same reviews policy as everyone else. 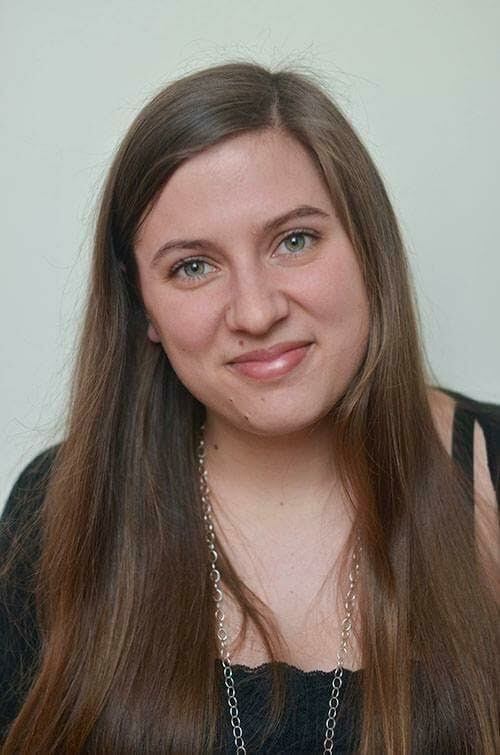 They have no influence on that review and the reviewer must not have any kind of close social connection with the reviewer, nor an active professional connection. We trust our reviewers to remain objective but always emphasise that the reviewer is not in any way a close associate of the show they are reviewing. I know one or two people who will stop short (but only just) of physically attacking me if I use the word “objectivity” in a sentence. They don’t believe in objectivity. They say “objectivity is both impossible and arrogant”. Subjectivity is all there is. We have only our point of view, from where we stand. No one else stands exactly where we stand, and we can’t stand anywhere else while we are standing there! Well, that’s physically true. But it isn’t imaginatively true. It is possible to “put ourselves” in another’s shoes. It is possible to imagine a situation from different viewpoints, to collect information that has been gathered by others from unique perspectives and to then imagine ourselves into different viewpoints. The imagination is subjective but the striving is towards objectifying it through what science calls “triangulation” – taking more than the subjective perspective into account. FringeReview is all about striving for objectivity, wherever we can. In theatre reviewing, the priority is to attempt to look at the theatre from an objective viewpoint. Our own subjective response is just one viewpoint among many. But the reviewer’s responsibility is to imagine themselves into other viewpoints. The key position of imagination here is what is often called the “Helicopter view”. The reviewer tries to gain an overview of the show as a one-off piece of theatre. The overview allows the reviewer to look at the show’s various elements – its overall impact, the way it has been designed, staged, written and performed. The reviewer imagines the show as a director might imagine it, a producer, and an audience member might imagine it. The act of imagination isn’t fantasy imagination. It is imagination that also allows the reviewer to see THEMSELVES and to see their own subjectivity as just ONE PART of the experience. And for me, that’s what I mean by objectivity. We attempt to observe our own subjectivity as an object of observation and, insodoing, perhaps become a little freer of subjective bias in reviewing. RECOMMENDED, HIGHLY RECOMMENDED and OUTSTANDING. The Following article still has value in this discussion, so we have kept it! The right to silence isn’t really well understood in these mistrusting times of win-lose and hidden agendas. It is often assumed the silence hides a hidden agenda; silent looking has been parodied in the worlds of Harry Enfield as “What are YOU looking at- silent eye contact is a judgmental invasion of another’s’ “space”. Silence can be seen as the greedy hoarding of secrecy in an age where people publish their most personal thoughts and affairs on their Facebook profiles and status messages. Silence is often called “weakness” and “fear to publish”. And, of course, you must be “hiding something.” In the theatre world perhaps very ironically, silence is fundamental to performance. The pauses in a play or a piece of physical performance, the silences are vital; sometimes they are “telling” in relation to a narrative or an “effect.” Sometimes they create necessary calm or space for an audience to disgust, to breathe, or to enjoy the tension or mood of a piece. For FringeReview, when a reviewer sees a show that is deemed by the reviewer to be poor theatre, she/he – in terms of publication – decides upon silence. One or Two star shows (Less than good, or poor examples in the genre) are not published, but are offered as private feedback to the performing company (an offer not always taken up, making the silence almost total!). Why don’t we “speak out” about bad shows? It is because of the mode of expression chosen by the writers of this publication. The mode of expression is one of seeking to speak publicly about what we find to be good, very good, or outstanding. On FringeReview you enter a place where only the good, very good, or excellent has been chosen. The weeding of our garden is done silently, quietly. One practical reason is a belief that at least one publication in the theatre and arts world performs a unique service to its readers and potential theatre audience is it selects on behalf of the readers what is good, and publishes and celebrates that. A kind of filter, a “good food guide” of theatre. We don’t publish a list of places NOT to eat at, for we find an abundance of places TO eat at, some unmissable. Seeking out excellent is not a cheesy thing, and choosing NOT to speak about the poor quality is not hiding or withholding. It’s a mode of expression that is very practical. If our publication’s reviews are quality and invite and achieve trust from our readers, the publication becomes a reliable, trustworthy place to find, among the “Cacophony”, places of clarity, harmony, delight, surprise, challenge and peak experience. Finding a five star show becomes a cause of celebration; so we publish. Finding something that is poor because an opportunity either for silence, or for a more quiet conversation, one-one where potential can be explored, feedback respectfully given and where possible, innovation and improvement embarked upon. It isn’t always an easy process giving difficult feedback as a reviewer. it becomes a much more healthy and effective process if it can be done one-one, in a small group, and with a spirit of constructive improvement at the heart. Publishing negativity can also be a useful service. It can serve as a warning for an audience of what shows to avoid. There are many such publications. Where there is so much choice, such as a Fringe Festival, the list of “what not to sees” can be an important list in choosing “what to see”, But so can a good theatre guide as well. It often depends on the reader or potential audience member. Some prefer to root out the bad, and even enjoy reading the damning reviews of other’s attempts to be excellent. Others look to seek out the good, and look for the tour guides through the theatre domain. FringeReview enjoys the silence; the publication is a place where you’ll find reviews and previews, selected by people passionate about theatre, of shows we recommend. Go see this! Go see that! If you see NOTHING else, go see this! You’ll see a reliable guide to what to see. What you won’t see nor hear, are the silences that make that reliable selection possible. But the silence makes this very useful guide possible. Our silences make what we say all the more clear and useful to our readers who are looking for shows to see. And enjoy. And love. And see again! You are currently browsing the archives for the Advice For Reviewers category.